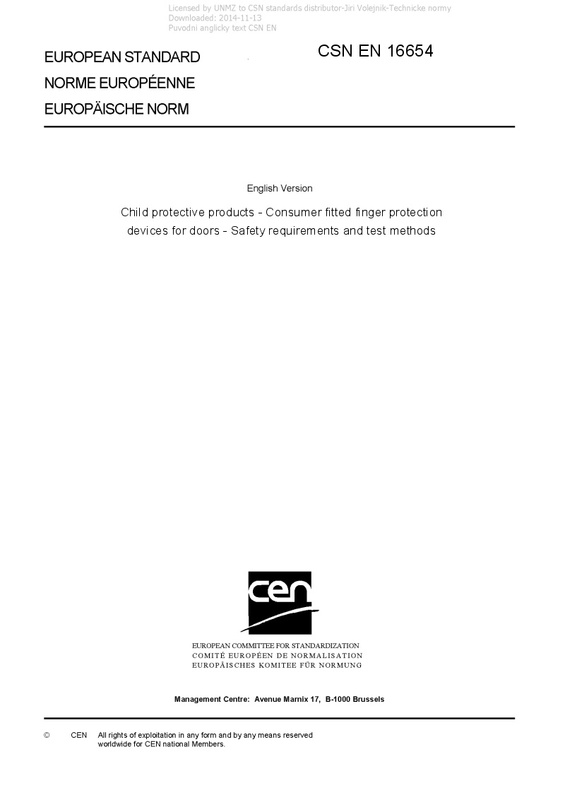 EN 16654 Child protective products - Consumer fitted finger protection devices for doors - Safety requirements and test methods - This European Standard specifies requirements and test methods for consumer fitted finger protection devices intended to be mounted on hinged doors in the domestic environment inside buildings in order to prevent crushing injuries to children as a result of the door closing. A finger protection product is based on at least one of three protection methods: hazard shielding, shut prevention or shut controlling. NOTE 1 Products intended to maintain the door in a fixed position and friction hinges are not covered by this European Standard. NOTE 2 Finger protection devices intended to be installed by professionals or that are an integral part of the door system are beyond the scope of this European Standard.